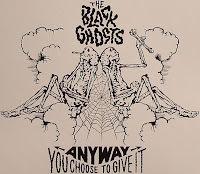 I first heard about The Black Ghosts thanks to a Switch remix that I found on hypemachine (what a great site). A little later I got to hear the Boy-8-Bit version of Anyway You Choose To Give It, and finally stumbled upon the Fake Blood mix. I loved both the remixes, and something told me I could have some fun tinkering with them. Both have a very different take on the song; Boy-8-Bit is obviously retro and fully vocal, Fake Blood (who are these guys?) are heavy on the Max Headroom-style stuttering and rave sounds. However, both mixes are at exactly the same speed and in the same key. Putting them together was just a question of finding the right moment, and tweaking the levels a little bit where the two are superposed. Frankly, it's one of my all-time favourite, seamless edits. Download the 9-minute beauty here (you'll need iTunes to listen). And here's the video. It's kinda cheap and silly - Fame meets a physics lesson - but I suppose they need a bit of MTV airplay to get them going. Apparently a full album is due this year through Southern Fried.